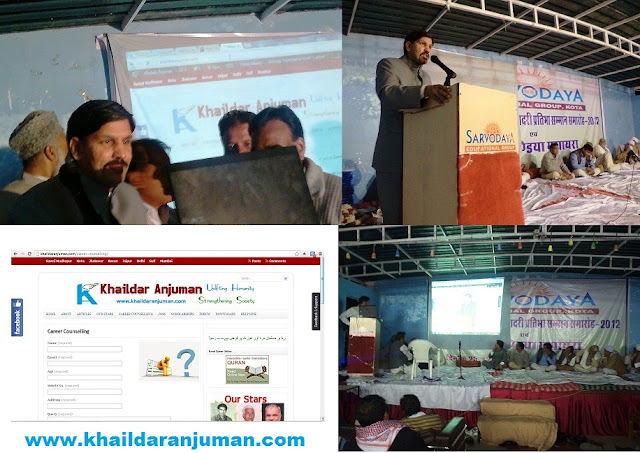 Kota, Rajasthan – 26 Dec ’12: The website of Khaildar Anjuman (www.khaildaranjuman.com) is launched tonight at 10pm by Mr. R.P. Yadav (Vice Chancellor, Rajasthan Technical University, Kota), Mr. Abrar Ahmed (1st RAS in Khaildar Samaj / CEO – Udaipur, Rajasthan), Mirza A. Gaffar (Educationist, Founder & Chairman Sarvodaya Educational Group, Kota) , Dr. Mohammed Naeem Falahi (Asst. Professor, Govt. PG College, Kota) and Prof. A. Hanafi (Director) in an excellance award ceremony and all india mushayra which is held in Sarvodaya Paramount School, Kota Rajasthan. Dr. Yadav appreciate the website team after the launching of the website, and he said it is a necessary requirement in this technical and global age. Later on the website team felicitated by Mirza Abdul Gaffar, Prof. A. Hanfi and other guests with a momentum and an appreciation letter. Mr. Ziyaul Islam (Webmaster of khaildaranjuman.com) said this website is very beneficial especially for our new generation and he describe all the features of this website one by one. Mr. Ziyaul Islam also thanks to the whole website team for their tremendous efforts as well as Sarvodaya Educational Group for their support.